Fairytales came true last 18 March 2017 as kids, parents, professors, and students got the chance to learn and play as beloved storybook characters came alive during the annual SLP Play Day at the Education Playground of the University of Santo Tomas with the theme, “HaPLAY Ever After”. 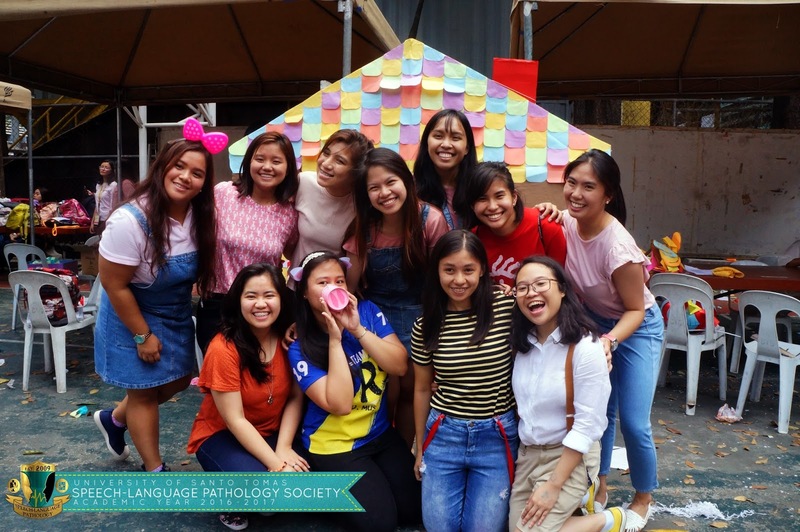 Spearheaded by the UST Speech-Language Pathology Society, the play event provided an avenue for students to interact both with kids and parents while incorporating learning into play. The vibrant and colorful booths of Pinocchio, Little Red Riding Hood, The Three Little Pigs, Goldilocks and the Three Bears, and Hansel and Gretel, had cognitive and integrative skills incorporated in the activities to maximize learning through play. When asked how on her experience, third-year batch representative Keziah Solomon recounted an experience she had with the kids during the event. She remembers a moment before all the booths were set when she would prompt a kid after seeing that he was interested with the preparations. “When I got home, I saw a picture of me and that kid doing the makeup gestures. I suddenly became aware that what I was doing there was a small example of what I'll be doing as a future speech-language pathologist,” Solomon said. Each year level had their own booths where they incorporated different skills such as naming, categorizing, following directions, and problem solving, to match the different games. The kids were given prizes and loot bags after every activity. “It's just beautiful, how we can someday help these kids interact and communicate what they want to say and give them a greater quality of life. That's a great purpose to live for,” Solomon said. While the kids were having fun learning, a parent training seminar was being conducted by the interns and higher year students. The seminar covered speech therapy and expectation setting, the importance of play and language stimulation for kids, as well as the importance of carryover goals at home. The parents shared their own experiences with the group as well as raised questions in what to do during and after therapy session. As a treat, the event culminated with a spectacular magic show, that marveled kids, parents, and future speech pathologists who all came together to celebrate the fun in learning. Members of ASP UP-CAMP were among the event participants. “We hope to extend our festivities next year, creating booths that are more engaging, interactive, and fun-filled for the clients, while still incorporating speech and language therapy goals for them,” Miclat said.